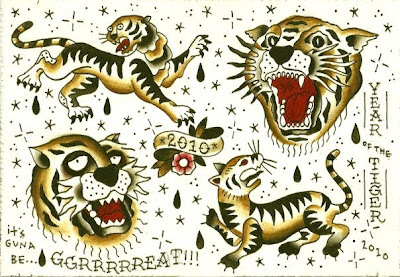 From Noon to 10:00 PM, artists in the shop, which just opened on December 1, 2009, will be inking Year of the Tiger tattoo specials for $50.00 apiece. It's first-come, first-served, folks, so don't show up too late. This piece was created in four sittings lasting 3-4 hours each, by John Reardon at Saved Tattoo (which was the shop responsible for yesterday's post, too). 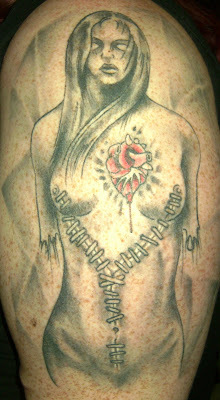 Work from John Reardon has appeared here on Tattoosday previously. Work from Saved appearing on the site can be seen here. 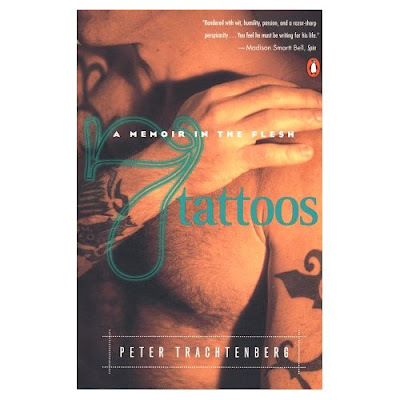 Reardon is also the author of The Complete Idiot's Guide to Getting a Tattoo . That is a deer skull that the gypsy woman is wearing, complete with a set of antlers. When I asked Max about this he acknowledged that the tattoo, in concept, had started as just the old-style gypsy profile but, growing up in Maryland, he said that there were deer everywhere around his home, and that this was a nod to his former home state. Perhaps reading too much into it, I asked him if he was taking a symbol of home and tying it to the nomadic image of the gypsy to illustrate a dichotomy between the two contrasting lifestyles. He nodded and said he hadn't thought of it in those terms before, but it seemed to make a little sense if you looked at it like that. 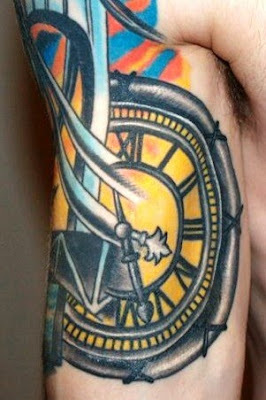 This is one of nine tattoos Max has. The piece in question was designed by Paul Bosch at Saved Tattoo in Brooklyn. 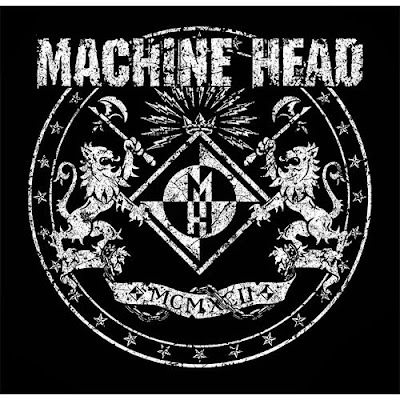 Max came to Paul with the concept and left it to the artist to design the tattoo. Work from Saved has appeared previously on Tattoosday here. 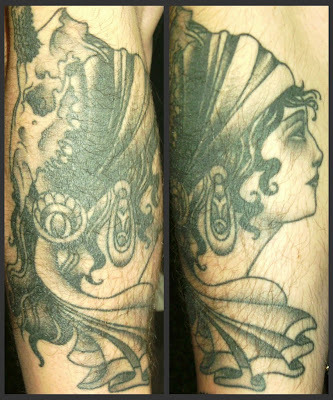 Thanks to Max for sharing this fascinating spin on the traditional gypsy tattoo with us here on Tattoosday! With winter upon us, I have been tempted to bemoan the scarcity of visible ink on the streets (or subways) of New York. But Mother Nature giveth, as well, by depositing the powdery white stuff and causing delays that held up commuters in Penn Station. One such soul was Kaeti, a visual artist passing through NYC on her way from Philadelphia. Kaeti originally thought she was going to get a sleeve inspired by the work of Salvador Dali, but the scale and concept didn't converge in a final design. She went to the artist, Andrew Johnson-Lally, at Body Graphics on South 4th Street in Philadelphia. She described for him the general concept behind what she wanted, something along the lines of a representation of a female figure, deconstructed. Kaeti also is very influenced by stitching, so she brought along examples of work she had, which included stitched sculpture and sketches. Andrew drew something up based on these styles that she liked, with her ultimately yielding creative freedom to the artist. To me, she was describing a collaborative effort, which many tattooists and their clients create. Another example of her influence on the end drawing is the empty eyes, which Kaeti said was similar to a lot of the work she herself was doing around the time of the tattoo being inked. The whole piece took about 3 and a half hours to complete. Initially she told me that when the tattoo was initially completed, she thought that it was finished. Like many people with large tattoos, however, Kaeti is tooling with the idea of expanding the work to include background, which might involve wrapping around her arm and making it a "true" sleeve. Incidentally, work from Body Graphics has appeared previously on Tattoosday here. I want to thank Kaeti for taking the time to speak with me in a crowded Penn Station, and for sharing her fascinating tattoo with us here on Tattoosday! 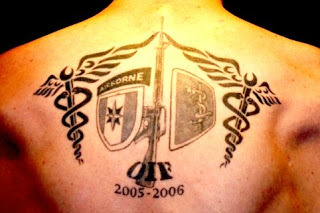 This tattoo consists of a pair of variations on the caduceus, surrounding the insignias of the 44th and 30th Medical Brigades - the two units he was assigned to in Iraq. Thanks again to Josh for sending along these pictures and if you haven't seen the Verrazano tattoo linked at the top of the post, you must go check it out. We here at Tattoosday love our fans. However, sometimes when someone sends us a submission from abroad, we may be slow to post it. Brandi and Aaron's submissions are the extreme case in point. Brandi e-mailed me back in April. Yes, as in that part of the calendar six months ago. Oh, I had grand plan for the post, planning to unveil it to coincide with a cinematic release, or a DVD release, but I could never get the timing just right. In the better late than never category, let me introduce you to a couple of tattoos that have been patiently waiting for their moment in the Tattoosday sun. 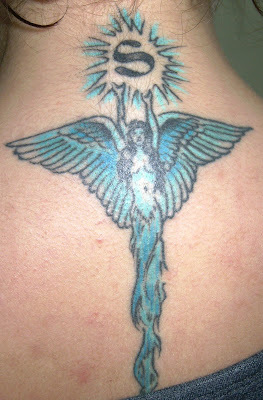 "This tattoo is one I got on my 25th birthday but it had been 7 years in the making. I lived in Seattle, WA for 10 years (currently in Texas) and have always loved snowflakes so for my birthday I decided to get this tattoo in memory of my life in Seattle." The second tattoo is from Aaron. Just to show you how long it has been, when they first sent the photo in April, Aaron was her boyfriend. In a follow-up e-mail a few weeks ago, Brandi called him her fiance, so congratulations are in order as well! 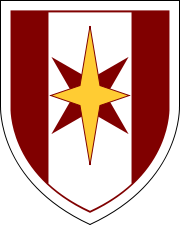 Yes, that is the crest of Gryffindor, the crest of one of the four "houses" at Hogwarts School of Witchcraft and Wizardy in the the Harry Potter series by J.K. Rowling. This tattoo is the first installment of a sleeve project Aaron is in the process of that was started after I suggested to him he get it. 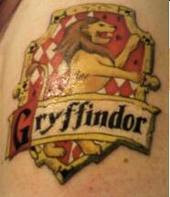 He is a HUGE Harry Potter fan and I thought what better way to express his love for HP. The rest of the sleeve will be black and white illustrations from each book and I couldn't love him more for expressing his inner "dork." I also am a fan of the series and have also share the qualities of dorkitude from time to time, so how could I not share this cool tattoo with our readers? Both tattoos were inked at Epic Tattoos in Fort Worth, Texas. 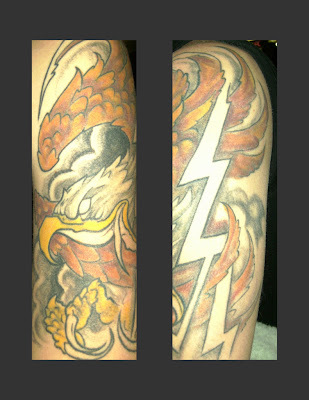 Nick Clark did Brandi's snowflake and Rudy Perez inked Aaron's Gryffindor piece. Thanks to both Aaron and Brandi for sharing their work with us here on Tattoosday and for waiting so patiently for me to get around to posting their tattoos! I had somewhere to be and a few minutes before I had to be there. At the intersection of Clark and Henry Streets in Brooklyn Heights, I saw a guy stride into a corner bodega. Something told me to peek in. I did. 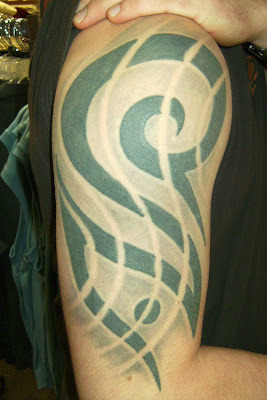 And there, on the back of his right arm was a cool-looking tattoo. So when he exited the store I introduced myself and we walked twenty yards to a well-lit frame shop to talk about his work. His name is Jack and he works as a framer but is also a painter and fine artist. Feel free to check out his website here. His work is quite good. 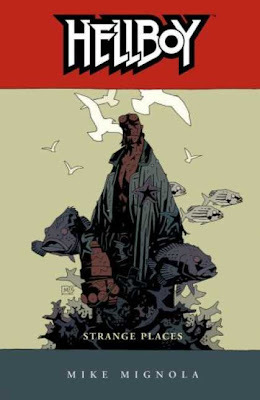 Jack is a fan of graphic novels and this piece is based on a panel from the a Hellboy book (Volume 6: Strange Places) by Mike Mignola. The words in the upper corner of the panel are "I will cast off my afflictions...". 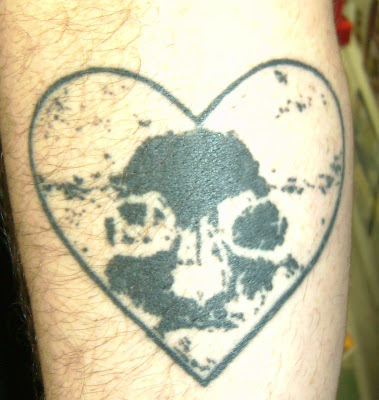 The tattoo was done by Erick Diaz at Asylum Tattoo in Williamsburg, Brooklyn. 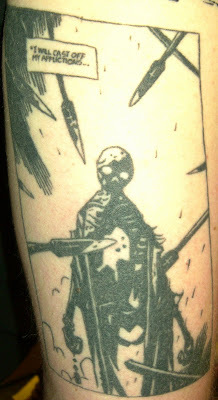 A Hellboy tattoo has appeared previously on the blog here. You may remember the name of Erick Diaz and Asylum Studios based on an appearance on Tattoosday previously from this amazing back piece. 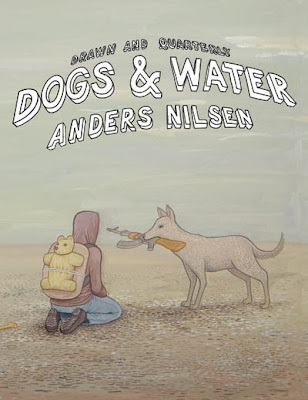 This art is based on the work from another graphic novelist, Anders Nilsen. The piece in question is from the award-winning Dogs and Water. 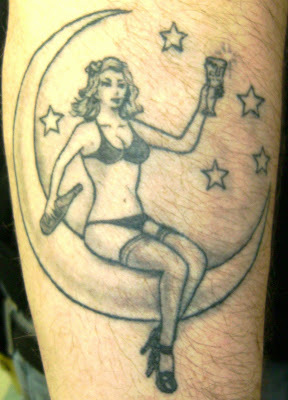 Jack credits this tattoo to an artist named Jasmine Morrell, aka Jazzy J, who he referred to as a "kitchen surgeon". In other words, this is an example of a home-inked piece, more commonly known as a kitchen table tattoo. Not to say that she is not a professional. In fact, Jack informs me that she is an artist at Atomic Tattoo in Austin, Texas. Both pieces reflect Jack's love of graphic novels. He adds "I have 4 tattoos, all from comics, the earliest was a back piece from Winsor McKay's Little Nemo in Slumberland." Perhaps we'll see that here in the future! Thanks to Jack for sharing his amazing tattoos with us here on Tattoosday! I met Daniel in Penn Station yesterday, one of the few people with short sleeves, and certainly the only person with visible ink. 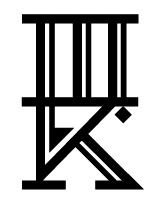 The Roman numeral MCMXCII refers to 1992, when the band released its first album. Daniel has seen the group perform seven times (as of this writing). When I asked if the band had ever seen his tattoo, he did tell me that he had met their tour manager at their airport in Brisbane and he had given him backstage passes to the show. Unfortunately, his plans fell through and he wasn't able to make it to the concert. 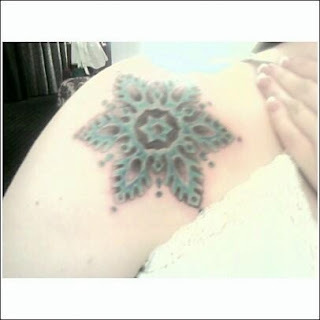 The tattoo was done by Jonny at Abandoned Art in the Wanneroo section of Perth. Thanks to Daniel for sharing his tattoo with us here on Tattoosday. I was folding clothes at the laundromat yesterday afternoon, bemoaning the fact that it appeared as if another weekend would pass without a new tattoo photo, when I caught a glimpse of some ink on the back of the neck of a fellow laundry-doer. Sandra is a nurse in an Intensive Care Unit in a hospital ward that specilizes in treating patients with bone marrow and other forms of cancer. 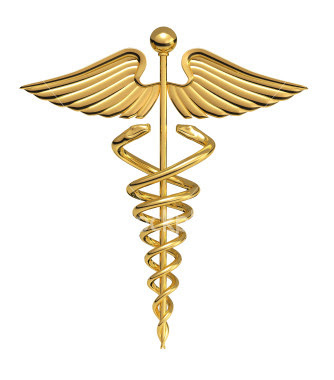 The letter S symbolizes her name and reflects her commitment to her profession. 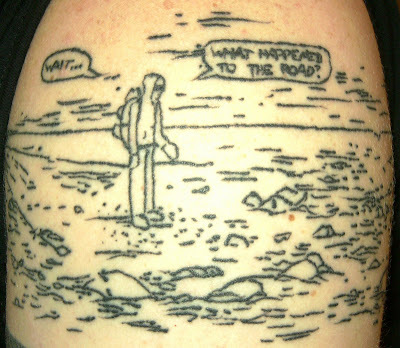 This was tattooed by an artist named Mike, who works out of his home in Brooklyn. Thanks to Sandra for sharing her tattoo with us here on Tattoosday! If you're still looking for that holiday gift, you might consider some attire inspired by Russian criminal tattoos. Last month, regular readers of Tattoosday may have noticed the ad that popped up on the left side of the blog, promoting a line of clothing from MiR1, an online shop run by a fellow Brooklynite named Roman, featuring designs based on and inspired by this style of tattoo. Our good friends over at the Needles and Sins Tattoo Blog even featured Roman's online shop as part of their Holiday Gift Guide feature earlier this month. Their piece on Russian Criminal Tattoo Apparel appeared here. You can also check out their Facebook page here. For the record, I have one of MiR1's hoodies and I'm very pleased with it. If the wind chill wasn't teens this morning, I might even wear it to work. But I'm not writing about this to sell apparel. Of course, you won't be surprised to hear that Roman has tattoos that run along the themes featured in his clothing line. 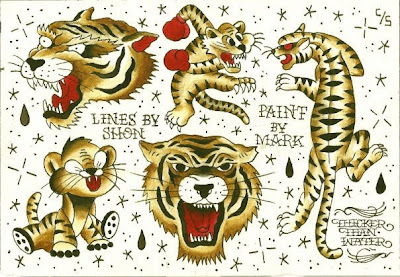 The cat has been a symbol in Russian criminal tattoo culture since the beginning, partly because the cat abides by it's own rules. 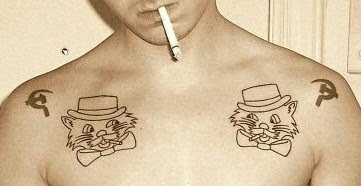 There are many variations of the cat tattoo. The cat symbolizes a thief that is good at what he does. 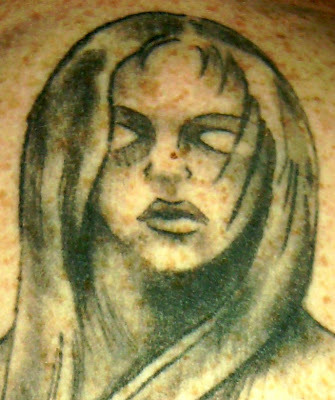 This tattoo can show a man's or woman's connection with the criminal world. The word CAT or "KOT" (in Russian)is an acronym as are many other normal words that are tattooed. KOT stands for "Korenoi Obitatel Tyurmi" or "Native occupant of Jail" as in Jail is my second home. The cats were done in Watertown Correctional Facility, by a man named Diablo. For 3 packs of cigarettes and some cakes, cookies, and various junk...Cats are supposed to bring good luck. One cat means u mostly act alone, two means usually with others or part of a crew. I really didn't care either way, I just like symmetry. I encourage readers to check out the clothing line over at their online shop here. 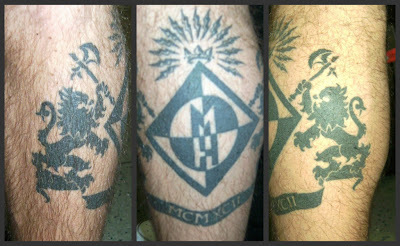 And thanks again to Roman for sharing his own personal ink with us here on Tattoosday! I was contemplating the best way to approach a rather imposing figure who was completely covered in ink, when Darren passed me at the entrance to K-Mart in Penn Station. When I caught up to him in the store, I introduced myself and, being a piercer in a New York City tattoo shop, he was more than happy to indulge my curiosity. 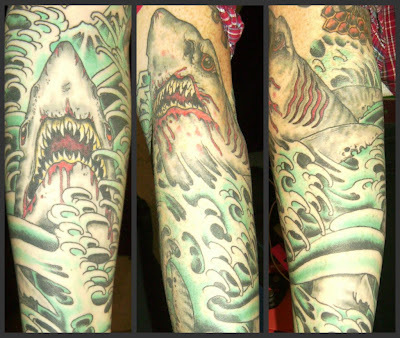 Darren has three tattoos, all on his arms and crafted by Young Cho at Monster Tattoo in the Elmurst section of Queens. 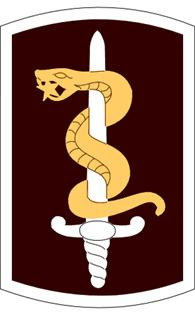 This is the outer forearm on his left side. 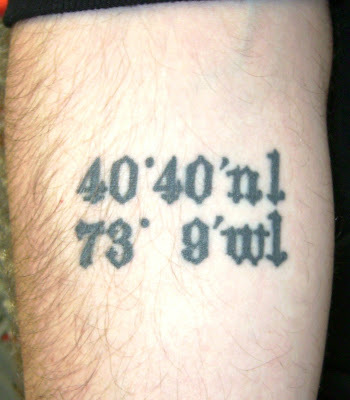 Located on his inner right forearm, this tattoo is translated as 40 degrees, 40 minutes, north latitude and 73 degrees, 9 minutes west longitude. These coordinates refer to a specific location in the world, in this case, a spot in the Great South Bay off the coast of Long Island. It was here that Darren's father loved to go fishing and the coordinates in question mark the spot where his father's ashes were scattered after he passed away. I must emphatically state that this is one of the coolest memorial pieces I have seen. It is extremely thoughtful and creative, speaking to a point on the earth where Darren knows his father will remain, in spirit, for the rest of time. I thank Darren for taking the time to stop and chat with me about his three tattoos here on Tattoosday! 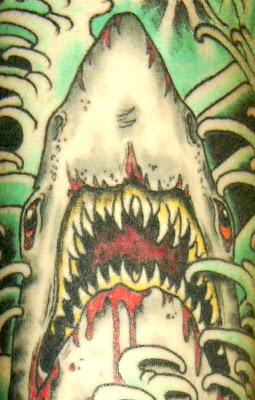 Inked by his younger sister, Mystie, who was an apprentice at the time in Savannah, Georgia, this is one of seven tattoos Jason has. He had been working as a grave digger and headstone carver and, he said, "after burying kids younger than me," it made sense to get the tattoo. It's a reminder that "nobody's got forever". 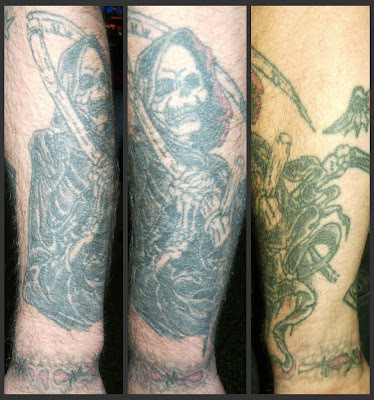 Thanks to Jason for sharing his "grim" tattoo with us here on Tattoosday! Yesterday, I joined my friend Janet for lunch at Chipotle on 45th Street. There was a fundraiser at which a $5 contribution bought you a burrito, chips, a drink, and an opportunity to meet Yankees manager Joe Girardi. His charity, The Catch 25 Foundation, was the beneficiary of all proceeds from lunch. Here's proof I'm not making this up. Janet and I were dopey enough to go without any Yankees memorabilia to get autographed. So he signed a flier for me and (yes, there is a tattooish point to all of this) declined to sign Janet's skin, above her "I ♥ NY" tattoo (featured on the blog here). It was worth a try. And no, Joe Girardi didn't offer up a tattoo. However, Janet and I grabbed the downtown V train after lunch. I got off at 34th Street and figured I'd cut through Manhattan Mall. Waiting at the bottom of the J.C. Penney basement escalator was Julio, visiting New York from Sweden. See! There is a tattoo in this post!! 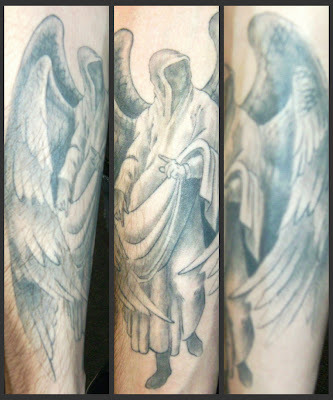 Julio's tattoo was inked for him by an artist at Magic Man Tattoo and Art in Skövde, Sweden. Thanks to Janet for lunch, Joe Girardi for the autograph, and Julio for the tattoo. Tattoosday appreciates all you did to make this post happen! I met Dan outside of Penn Station last week on a balmy December day. It's a memorial piece for a friend who passed away in 2008. Her initals are in the heart, which is pierced by a lone yellow rose. "She loved yellow roses," Dan told me, which led him do design this variation on the dagger-through-the-heart tattoo. The piece was inked at Fat Kat Tattoo in Keyport, New Jersey. Work from Fat Kat has appeared previously on the site here. 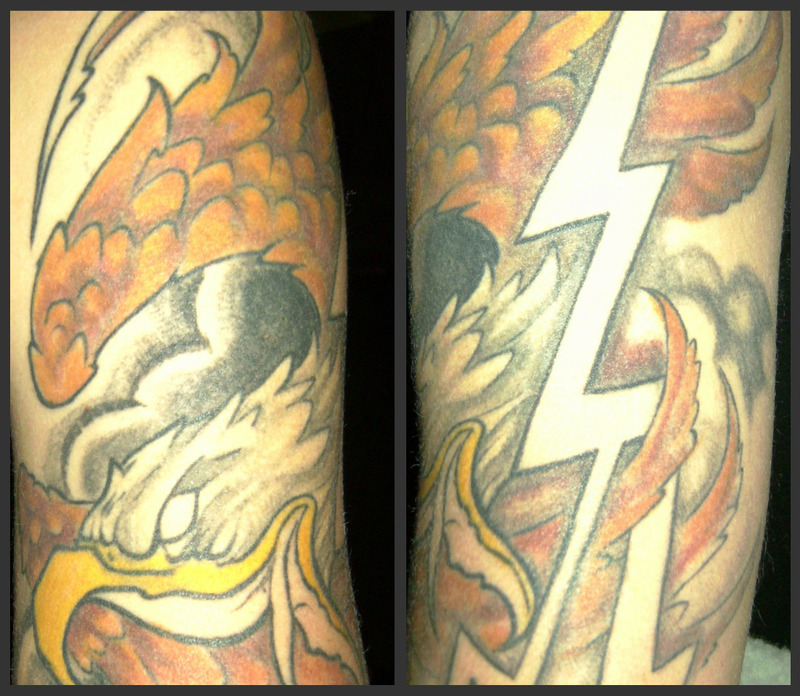 Thanks again to Dan for sharing his tattoo with us here on Tattoosday! 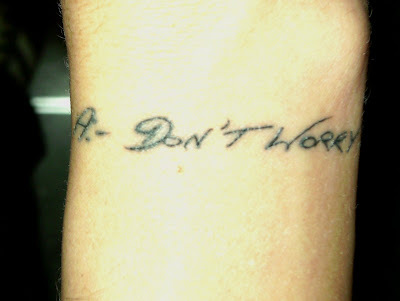 The tattoo reads "A: Don't worry". Turner explained that he is a performer/author/speaker who worries a lot, so it's sage advice that is always good to follow. The quote itself is from a segment in a one-man show that he performed called "Becoming a Man in 127 EASY Steps". During one part of the show, Turner answers self-posed questions in an imagined dialog with his father. One of these questions is: "Q: What's the number one thing to think about when you're a dad?" And the answer is "A: Don't worry". What's particularly special about this tattoo is that it is based on his father's handwriting. 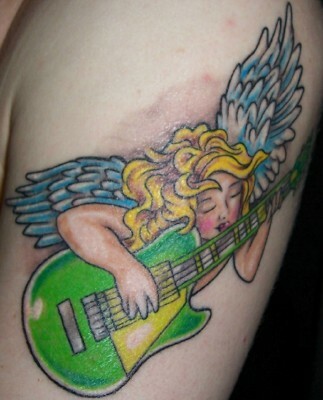 Turner had this tattoo done by Big Steve in Manhattan at Funcity Tattoo. He also gave me his card, which promotes Two Truths and a Lie. You can read about Turner at his site Undergroundtransit.com. It was there that I learned that Turner is a transgender, a woman who became a man. Of course, this adds, in my opinion, a whole different layer of meaning on the tattoo, and makes the experience of meeting Turner that much more interesting. He is just another example of what I love about writing Tattoosday. I get to meet so many people in such a wide range of diversity. It's well worth exploring his site to see clips of his shows to fully appreciate Turner as a performer. I thank Turner for sharing his tattoo with us here on Tattoosday! I'm cleaning out my inbox over at Tattoosday and am sifting through the gold. My lovely wife Melanie sent me this link back in June (yeah, June). So get your fill out of Ugliest Tattoos. I first became friendly with Nathan over at KnuckleTattoos.com as a peer in the inkblogging community. Based in Texas, Nathan's site specializes in what you would expect from the name, Knuckle Tattoos. 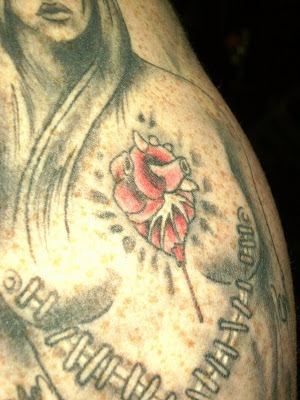 As a contributing writer, I have posted a handful of knuckles (ha) from people I have met in my Tattoosday wanderings in the Big Apple. And although the last post on his site (as of this writing) was back in May, Nathan has been busy indeed, traveling over the late summer, courtesy of a 30-day Jet Blue pass and blogging about it. The trip was documented here, on 30 Days in the Air. Not only that, he has ink to memorialize the journey. See what I mean in this post. Nathan was in New York as part of his adventure back in October and I met him for a slice of pizza on Broadway near Herald Square. Nathan explained that this is a "kitchen table tattoo inked by a Japanese fellow calling himself 'Cadillac'. He was in town [Austin] for a week from Japan tattooing in order to pay for his rent when he got back". 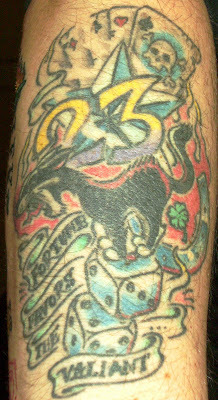 The tattoo features all of Nathan's "luck pieces," such as dice, cards, his lucky number (23), a horseshoe, a black cat, and a banner that reads "Fortune Favors the Valiant". It was great meeting Nathan and I thank him for sharing this tattoo with us here on Tattoosday! Last Saturday night, Melanie and I went into Manhattan for a small holiday gathering. We were going to see her old high school friend Vibeke at her mother's apartment on the Upper West Side. It had been quite some time since we had last seen Vibeke. We weren't sure, but our best guess was 1998. Vibeke had been living in Los Angeles, had recently married and moved to Houston. It was great seeing her again, and it was nice meeting her husband Matt. Invariably, Melanie asked Vibeke how she and Matt had met. She explained that, in the early '90s, she had been living on a boat in St. John, in the U.S. Virgin Islands. For a while, the only way she could get to shore from the boat where it was moored was to swim. I'm guessing she also occasionally hitched a ride on someone's dinghy, but her primary shore-to-ship mode of transport was her own arms and legs. As one would imagine, this proved to be problematic. So she invested in an inflatable dinghy and a small outboard motor to more practically transport her to and from dry land. When the motor developed a problem, she took it into a shop for repairs. A gentleman named Matt was the proprietor and he repaired it. A little tension developed when, as Vibeke tells it, the repairs were less than satisfactory. More work was done, apparently to her standards and from this initial meeting, a romance blossomed. After six months, Vibeke decided, for various reasons, that she would return to the states and move on with her life. The relationship with Matt abruptly ended. Cut to the cinematic technique of a calender shedding pages like a tree in autumn, as time passed. Then 9/11 happened. 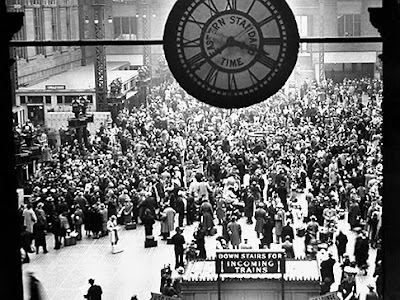 This prompted many Americans to feel the need to check in with past acquaintances and such. Vibeke looked for Matt, but he has a common last name and she couldn't find him. She was having, and continued to have, "where is he now" moments. She never found him. Earlier this year, she was proctoring a test for students at a public school in Southern California where she was teaching. The phone rang. It was Matt. He was beside himself. He had found her. Vibeke was stunned, but she was otherwise occupied. She gave him her number and told him to call back. He did. He lived in Houston, she was dating someone else. The next time he came to town she was single. They met. The rest, they say, is history. They were married in June and are now newlyweds in Texas. 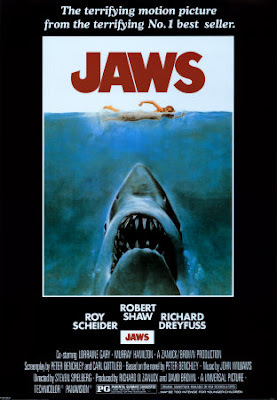 "What a great story," Melanie and I collectively thought. We were very happy for her, and him. Later that evening, Melanie and I were chatting with Matt near the kitchen. Matt asked about Melanie's ankle tattoo. He seemed interested. I mentioned Tattoosday. "Want to see something?" he asked. He motioned us into the kitchen, away from the rest of the party guests. "You've heard how Vibeke and I met, right?" he asked, touching a button on his shirt. We nodded. And he began to tell his story, similar to his wife's version, only he paused after speaking of her leaving the island way back in 1995. The month after she departed, still devastated from the abrupt end to their relationship, he returned to his home in Albuquerque, New Mexico. See, dear readers, there was a relevant point to this story. 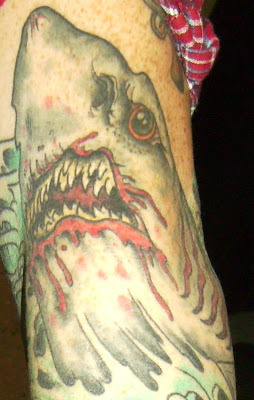 And Matt pointed out in this subtle aquatic tattoo, the marks of his true love. Here in the undulating leaves is a V for Vibeke, a C for her middle name, and an H (at the top of the piece) for her maiden name. Woven into his tattoo of lost love and despair were the initials of the woman he loved. And he had no idea where she was. But the years passed for Matt, as they did for Vibeke, and this ink in his flesh was an anchor reminding him of his love. And when people asked him about it, he explained it was just an aquatic-themed piece, an homage to his love of the ocean. And fourteen years later they reunited and picked up where they had left off in 1995. Now married to the woman whose initials were subtly inked into his flesh, the tattoo has changed. When fresh, the piece was a memento of loss, the missed moment of the road not taken, a reminder of a relationship that ended too soon. Over the years, the tattoo meant hope that some day, the two would cross paths again. It was a daily reminder of what was lost, and what Matt hoped to regain. Seemingly miraculously the two souls were reunited, and the tattoo, in its simple black and gray tones, represents perseverance and success. The ink may have faded in the sun, but the love only became more clear. Matt and Vibeke's story is quite remarkable, and the time they were apart has faded. Togetherness always defeats the pain of separation. I want to thank Matt and Vibeke for sharing their tale with us here on Tattoosday. It's not every day that we get to hear a full-blown love story on this site, and the fact that Matt's tattoo is at the center of it makes it even more wonderful. We originally introduced Tracy on Tattoosday back in January 2008 here. Inked on the inside of her left wrist, this simple message "Breathe" is a reminder to herself to "slow down and take it all in". In other words, when stressful things happen in life, pause, take a deep breath, and focus on the here and now. This serves as an anchor to keep her grounded. 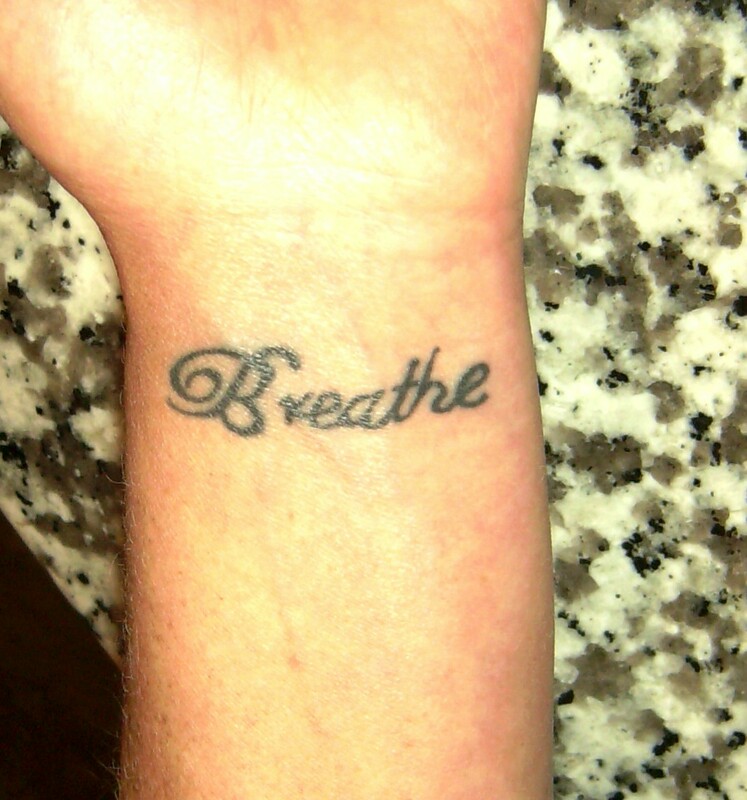 Words on the wrist are great ways to help keep the focus (here's another example from earlier this year). As a mother of two boys (one a teenager) and the wife of a soldier serving our country proudly in Afghanistan, one can only imagine the stress Tracy encounters on a daily basis. Yet every time I see her, she has a positive outlook and a smile. She's one of many people I know who use tattoos as symbols from which to gain emotional strength through challenging times. The tattoo was done at Tattoos Forever in Evans Mills, NY. Thanks again to Tracy for sharing her ink with us here on Tattoosday!